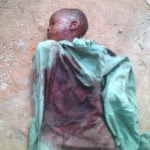 While the world joyously celebrated Children’s Day on thursday, a woman identified as Funmilayo Adeyanju, allegedly hacked her own son to death at Ogunso area of Otta in Ado-Odo/Otta Local Government Area of Ogun State. Adeyanju who hails from Ogun State reportedly stabbed her son, Emmanuel on the head and other parts of the body with a knife. It was gathered that the child was a product of an alleged incestuous relationship between the woman and her own biological father. No reason has however been given officially for the woman’s act as investigation is already on to know the motive behind the crime. While confirming the tragedy, the state Police Public Relations Officer, Muyiwa Adejobi, said the police have arrested the woman while the case is been investigated. “The police will work on the state of mind of the woman and will have to seek the help of an expert to know her mental state,” Adejobi said.